As a parent, it’s always helpful to try and keep at least one hand free at all times. However, when trying to work and look after your baby, this is easier said than done. When I discovered ring slings, they single-handedly changed the parenting game forever. To help you enjoy this new lease of life, here are three of my favorite slings that will make you wonder what you ever did without them. To ensure your days are as easy as possible, here are three amazing ring slings that keep your baby safe no matter what you’re up to. With five unique sizes and over 15 vibrant and attractive colors, the Storchenweige Carrier Wrap is my all-time favorite wrap. This perfectly designed wrap comes all the way from the experts at Germany. During production, these wraps are created under strict regulations. These regulations help you to guarantee both quality and durability. What's Great About It: As one of the highest quality ring slings, each end is tapered for easy tying. This gives you the easiest, safest and most comfortable experience possible. If you’re looking for a super-soft, extremely comfortable ring sling, then you’ve come to the right place. 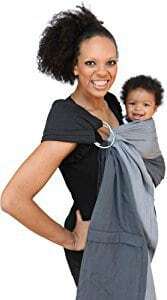 The Mamaway sling is made from 100% Pima cotton, making sure you and your baby are nice and snug throughout your days. The sling is highly adjustable, meaning you can position your baby however you like. This could be upright, against your hip or on your chest. You can even position this sling for when you’re lying down. It’s incredibly easy to clean this sling by hand, and the extra materials mean you can enjoy further privacy when you need it. What's Great About It: The durability levels of this sling are outstanding. It’s been proven to hold a maximum of 50 kg over 24 hours without damage, allowing you to be safe in the knowledge that your baby is safe and secure at all times. 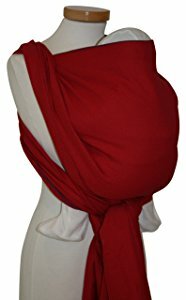 This unique ring sling provides you with an incredibly comfortable experience. This is due to the removable and optional padding. This means that you can feel fully supported while having the ability to enjoy skin on skin contact with your child. These slings are also available in two exclusive sizes, and there’s a collection of fourteen designs to choose from. This allows you to pick the one you love for the most enjoyable experience possible. The highly durable materials used support your baby in an upright position, ideal for breastfeeding. These materials can also support babies as small as 8 pounds, all the way up to 35 pounds. What's Great About It: My favorite feature of this ring sling is the built-in pocket. This means you can wear it while you’re out and about without having to worry about bringing your purse or handbag. There are several things you’ll want to look out for when it comes to choosing the ideal ring sling for you. Firstly, and most importantly, you and your baby will want to feel close to each other. This means you’ll want a thin material that’s lightweight and breathable. You’ll also want to ensure that the ring design is adjustable. This will allow you to move and position your baby however you need them to be, depending on what you’re doing. All in all, you’ll be looking for a design that creates a cuddly, snuggly hammock that nurtures your baby while holding you both close together. One of the biggest benefits that a ring sling provides is when it comes to breastfeeding. You’ll want a sling that can be easily adjusted to make this as natural as possible. For me, this is one of the most important factors to consider. Throughout your day-to-day life, you’ll want to ensure that your chosen sling allows you to keep at least one of your hands-free. With this in mind, check that the sling supports your baby’s weight. Always check the manufacturer’s guidelines for this information. Another outstanding benefit that these slings provide is if you’re heading out to a crowded public place. If you live in a city, for example, you won’t want the hassle of trying to maneuver a stroller. A ring sling eliminates this problem. Additionally, you may want to breastfeed your child in public. For this, you may want a bit of extra privacy. If this is what you would prefer, look for a ring sling with extra material that can be used as a privacy shield. This feature is also essential if you want to protect your baby from external elements. This can include wind, rain, and snow. The extra material is also perfect for keeping your baby warm on colder days. Finally, one aspect you may want to consider is if your baby suffers from colic. This could also refer to babies who suffer from common conditions such as acid reflux. If this is the case, look for slings that position your baby in an upright position. This will help to alleviate any pain or discomfort that your baby may be feeling, ensuring that you and your baby are both happy and comfortable. All of these features combined will provide you with the best day-to-day experience with your baby. This allows you to focus on the more intimate moments with your child, rather than having to worry about the stressful little parts of life. Ring slings are easily one of the most beneficial accessories I have ever discovered as a parent. By keeping my hands free, my days have become so stress-free, especially when around the house and out in public. Get ready for a new life full of confidence and convenience.